As Congress begins negotiations to enact legislation that would give young undocumented immigrants known as ” Dreamers” the opportunity to continue to live and work in the United States, three former secretaries from the Department of Homeland Security have come forward to pressure lawmakers to come up with a legislative solution by the March 5th deadline proposed by President Donald Trump. As previously reported, the President has given Congress until March 5th to act before the majority of work permits issued under the now defunct Deferred Action for Childhood Arrivals (DACA) will begin to expire. Attorney General Jeff Sessions announced the termination of the Deferred Action for Childhood Arrivals (DACA) program during September of last year. 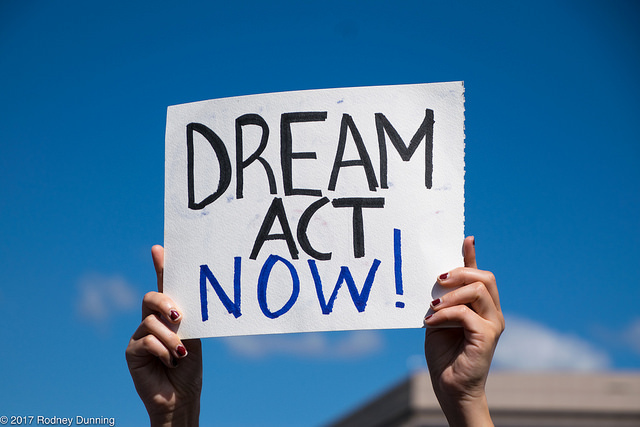 On January 3rd, Michael Chertoff, the former Secretary of the Department of Homeland Security under President George W. Bush, Janet Napolitano, and Jeh Johnson, former secretaries under President Barack Obama, fired off a powerful 2-page letter warning members of Congress that time is quickly running out for Congress to enact a legislative solution to the DACA problem in a responsible and realistic manner. The letter emphasizes that Congress must act swiftly, much before the March 5th deadline, to give the Department of Homeland Security enough time to “meet the significant administrative requirements” that would be necessary for implementation of any legislative solution proposed by Congress. The letter also affirms that swift legislative solution would ensure certainty for American companies and small business owners employing young recipients of DACA. In order to meet the objectives for implementation, the former secretaries urge that “the realistic deadline for successfully establishing a Dreamers program in time to prevent large scale loss of work authorization and deportation protection is only weeks away,” placing that deadline in the middle of January. Failure to enact a legislative solution by January, coupled with the fact that the majority of DACA recipients will begin to lose their status on March 5th, further intensifies the need for Congress to consider the DACA issue urgently in the month of January. More information to be provided as it develops.